This is the second in a series of profiles of the members of my critiquing group - the Kensington Writers' Group (KWG). This is a self-portrait of author, and KWG member, Naomi K. Lewis done through the medium of cookie dough and icing. It’s funny that she chose to portrait herself as a cat because she is so allergic to cats, that when I go to her condo, I am instructed to take off my shoes and socks and leave them in the hallway (my smelly socks are a nice treat for the neighbours). I also have to wear freshly laundered clothes (rather than my usual sasquatch wrap) – okay, this is doing nothing to dispel the myth that I’m a crazy writing cat lady! 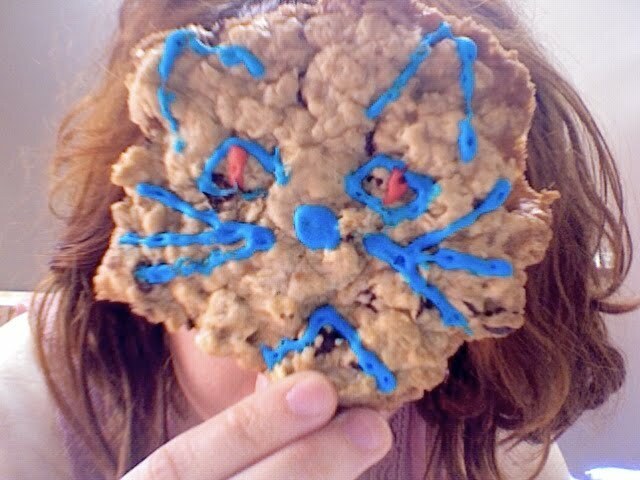 She made those cookies for the meeting we had when we were reviewing my manuscript Dead Bird through the Cat Door, the second in the Megabyte Mystery series. The sweet mix of chocolate and oatmeal took away the sting of the feedback (naw, it was all constructive and awesome feedback which I used in the rewrite). I met Naomi at Lori Hahnel’s book launch a year ago. And I quickly realized that she was a writer I needed to infiltrate into the Kensington Writers’ Group. It didn’t take the others long to agree. Naomi is the author of Cricket in a Fist – a novel about a family losing one of their members to her own self-help movement, “willing amnesia.” Check out a review I did on Chapters (for some reason it was posted twice - must be my superior technological ability - not!). Naomi has several teaching gigs coming up – on November 28th, she’ll give a workshop on character development at the Calgary Public Library’s Teen Writing Conference. Beginning in January, she’ll teach a full-year novel-writing course at the Alexandra Writer’s Society Centre, and Creative Writing Level 1 at Mount Royal University. She is also a ghostwriter, and most recently worked with burn survivor and motivational speaker, Spencer Beach, on his memoir, which is scheduled for publication in the spring. Until this month, she was associate editor of Legacy magazine, which just put out its last issue. When Naomi isn’t busy making banana bread in her toaster oven (don’t ask) and writing for magazines she is busy working on her next novel and short stories. So check out her book and her site, maybe some day she'll make you banana bread (with chocolate chips)! Mmmmm. Sounds like your crit group is fantastic.